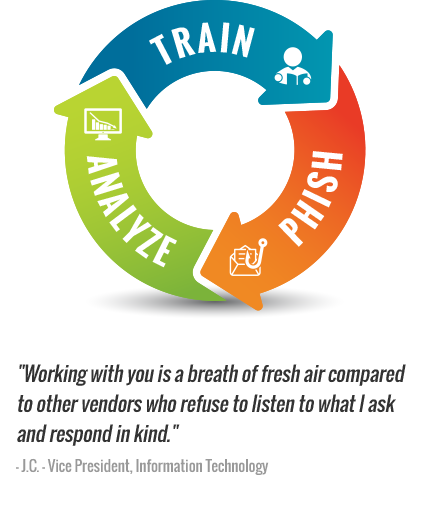 KnowBe4's Enterprise Awareness Training Program provides you with a comprehensive new- school approach that integrates baseline testing using mock attacks, engaging interactive web-based training, and continuous assessment through simulated phishing, vishing and smishing attacks to build a more resilient and secure organization. CISO's that use KnowBe4 sleep better at night. KnowBe4 was the first to provide you with "double-random" message delivery. Choose from 2,100+ highly realistic phishing messages, spread over time during working hours. Every employee receives a different phishing email at a different time. New templates from the wild are constantly added and we create "Current Events" templates for you. We offer three Training Access Levels: I, II, and III, giving you access to our content library of 500+ items based on your subscription level. Unlimited access to all phishing features with flexible licensing. No artificial license ceilings and 10% overage allowance. Powerful new features added regularly. No time to deploy your awareness training program? Our experts will work with you to create a project that meets your unique needs and give you actionable reports to improve end-user security. Our Managed Servicesoption is fully customizable. Interested in seeing all the features in KnowBe4's Security Awareness Training? 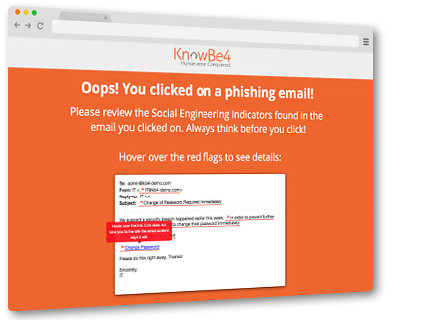 With world-class, user-friendly, new-school Security Awareness Training, KnowBe4 gives you self-service enrollment, and both pre-and post-training phishing security tests that show you the percentage of end-users that are Phish-prone. KnowBe4’s highly effective, frequent, "double-random" Phishing Security Tests provide several remedial options in case an employee falls for a simulated phishing attack. Effective security awareness training is hard. Today’s security awareness teams often don’t have the support, time, or resources they need to be successful and/or are missing the skills and experience to effectively create a fully mature security awareness program. To help you get started we’ve taken away all the guesswork with our Automated Security Awareness Program (ASAP). Find out how thousands of organizations have mobilized their end-users as the last line of defense. 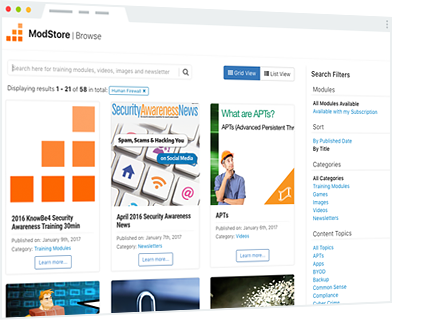 KnowBe4 provides you with the world's largest library of 500+ security awareness training content; including interactive modules, videos, games, posters and newsletters. We offer three Training Access Levels: I, II, and III, giving you access to our content library of 500+ items based on your subscription level. You will get web-based, on-demand, engaging training that addresses the needs of (very) large organizations. Trainees get a unique job-aid: Social Engineering Red Flags™ with 22 things to watch out for. Your Training Campaigns do the heavy lifting of getting users through their training. We can offer you a package or training modules customized for your organization. Our SCORM compliant modules can be hosted in our cloud-LMS or be uploaded in your own LMS. You can schedule regular Phishing Security Tests (PST for short) from our large library of more than 2,500 "known-to-work" templates, or choose from the community templates section, which were created "by admins for admins" to share with their peers. You can also create your own custom phishing templates. There are many more features! NEW Industry Benchmarking feature lets you compare your organization’s Phish-prone percentage™ with other companies in your industry. See where you stack up! 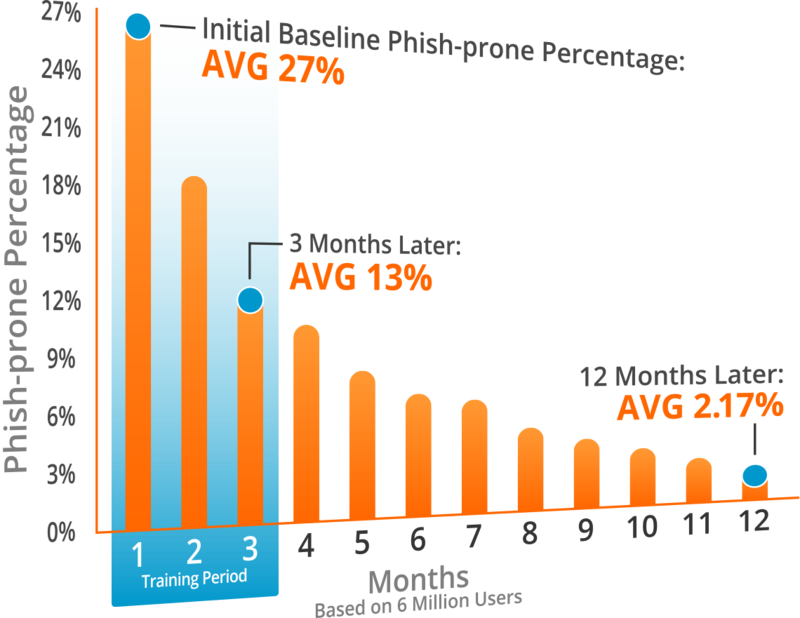 Monitor your employee phish-prone percentages over time and watch how performance from your initial baseline phishing test, after 90 days, and 1 year compares. With regular phishing security tests and training campaigns, you’ll see how your Human Firewall improves over time helping to reduce risk and improve your IT security defense. You’ll have real-time stats that helps you keep a pulse on how your security awareness program and employees stack up against other companies in your industry. Great intel to share with your management team! Our Phishing Reply Tracking allows you to track if a user replies to a simulated phishing email and can capture the information sent in the reply. You can also track links clicked by users as well as test and track if users are opening Office attachments and then enabling macros. Social Engineering Indicators™ (SEI) patented technology, turns every simulated phishing email into a tool IT can use to instantly train employees. When a user clicks on your SEI-enabled simulated phishing emails, they are routed to a landing page that includes a dynamic copy of that phishing email showing all the red flags. You can also customize any simulated phishing email and create your own red flags. Users can then immediately see the potential pitfalls and learn to spot the indicators they missed in the future. Smart Groups put your phishing, training and reporting on autopilot. Automate the path your employees take to smarter security decisions. With the powerful Smart Groups feature, you can use each employees’ behavior and user attributes to tailor phishing campaigns, training assignments, remedial learning and reporting. Create sophisticated, targeted workflows without the headache, and make sure every employee is a strong building block of your human firewall. You can see the intersection of the criteria you specify - whether you’re building simple phishing clickers remedial training workflow or complex, multi-criteria location, behavior and timing-based workflow. Best of all, Smart Groups is a powerful ad-hoc, real-time query tool that you use to get detailed reporting for management, so you’ll always know how your security awareness program is working. See Smart Groups in action, watch The Incremental Phishing with Smart Groups video here. KnowBe4’s Active Directory Integration allows you to easily upload user data and saves you time by eliminating the need to manually manage user changes. Once the ADI is configured, users will be added, changed and archived in sync with changes made within AD automatically. If you use Microsoft Azure AD, you can enable automatic provisioning for the addition and removal of users. For security reasons, the synch only works one-way. You can also upload users with CSV files. Security Roles allows you to assign granular access control for users and groups within the KnowBe4 console. Create custom permissions for the exact roles needed by your organization. Easily allow groups like HR teams to access reporting only to review individual user results or employees with creative control to create phishing templates and landing pages. The reports are exportable, provide geo-location of failures, and help you focus on the areas that will benefit you the most. You are able to improve your decision-making and reduce security risks across the whole organization. Executives get the insight they need to maximize training ROI and track security compliance. You can also leverage KnowBe4's Reporting APIs for custom reports and dashbaords that integrate with Business Intelligence (BI) tools to give managment visibility into the efficacy of your security awareness program.